If you could track quality business metrics on an ongoing basis, what would be the most important data points for measuring success? While gross margin and customer satisfaction are essential for most companies in this space, there are several other areas that if properly reported, can be important indicators of a business’s overall health. We wanted to know what metrics event production companies found most valuable to their business, so we sent out a poll. Here are the results. The majority (76%) of event production companies named show profitability as most important for their business. The 2nd most critical metric was the number of events actually produced, which received 43% of the response. Several of the other responses have a direct impact on a show’s profitability. Let’s take overtime for example. 29% of respondents said that tracking the number of overtime hours worked is important to their business. Gaining real-time access to data such as when crew-members are about to hit overtime can, in itself, cause a show to become more or less profitable. The average pay rate and cost per position (27%) also directly impacts a show’s bottom line. Check out this year’s Crew Pay Rate Report to see if your rates are competitive with those found in the industry. 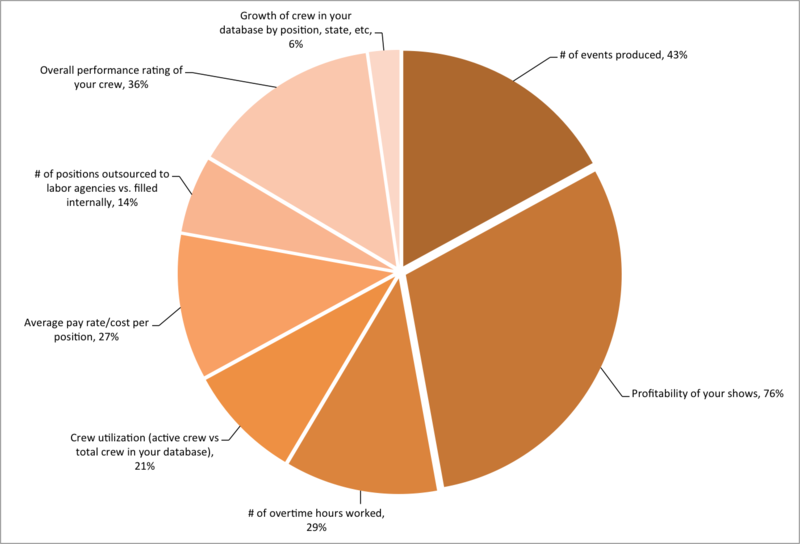 Tracking crew performance (36%) is also seen as an important business metric. Maintaining a quality crew is fundamental to running a successful event production company. And to help with this, many businesses are using automated tools, like LASSO, for measuring and monitoring crew performance. In a future survey, we will delve deeper into what metrics the industry uses to rate the performance of their crew. Are ratings based on just skill set or does punctuality, ability to build rapport with clients, and overall appearance play a part as well? Stay tuned for those survey results in the coming weeks. What do you think of the results? Is there anything that surprises you? Anything else you track or would like to track? Shoot us a note and let us know!